1)What does the approach identifier LOC D infer? This approach has been designed as a circling procedure only due to high terrain and the resulting high landing minimums. 2)Is a "straight-in" approach available within this procedure? Yes, note the “No PT 5200” designator on the plan view of the approach plate. 3)You are established inbound on the localizer between 15 DME and 8 DME on this approach. To what altitude may you descend? 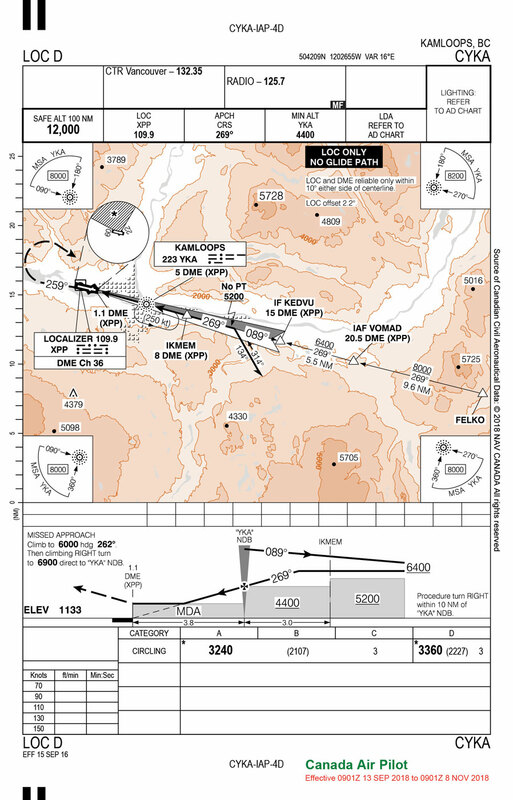 By referring to the plan view, between the IF at KEDVU at 15 DME and IKMEM at 8 DME you are legal to 5200 ASL. 4)How is the missed approach point identified on this approach? 1.1 DME from DME source XPP 109.9. 5)Your aircraft is not equipped with DME. Are you able to conduct this approach procedure? Negative; you will have to fly the LOC C approach where the missed approach point is based upon timing. 6)What would be the best means of confirming that the aircraft remains within the procedure turn "envelope" if conducting a full procedure approach? Remain within 10 NM of the YKA NDB, which is confirmed by staying within 15 DME from DME source 109.9.